The routes we make through inland routes of the Island, in which the circulation of vehicles is scarce, this provides us with greater freedom and security to focus on the most important, enjoy great moments. The guided tours that we offer on the island of Menorca will be an unforgettable experience thanks to the incomparable beauty of the island. Our guides will adapt to make the best route according to your wishes, to make it an unique and unrepeatable experience. 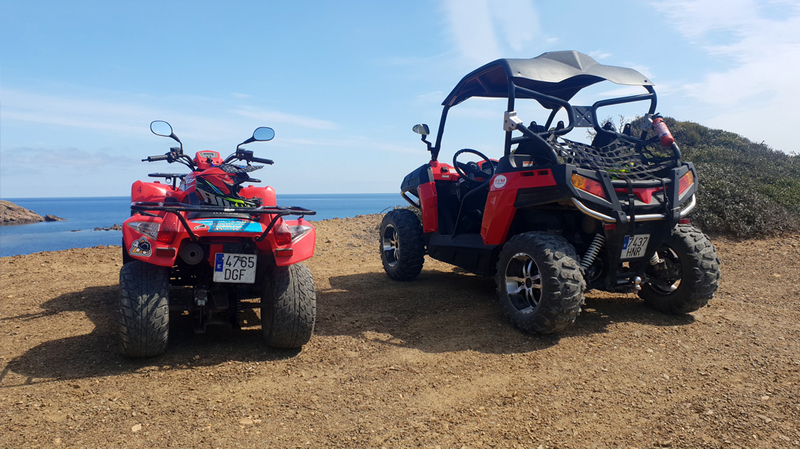 The routes are made according to the current laws, trough allowed paths and at moderate speeds, avoiding unnecessary risks and always respecting the environment. Our guides will ensure safety at all times, and in no case will they accept reckless driving attitudes that could endanger the safety of drivers or the integrity of vehicles. Do not forget, the most important thing is always to enjoy! * The routes will be made only from the rental of two vehicles, please ask us for availability. Enjoy nature and the incredible beaches of Menorca. Choose between our mid day and full day routes.